Nestled in the heart of Seminole Heights, Jug & Bottle specializes in craft beer, quality wine, and specialty foodstuffs you won't see at run-on-the-mill big box stores. With a heavy slant towards Bay-area vendors & breweries, they provide a distinctly Tampa and "Seminole Heightsian" shopping experience. The ONLY place in Tampa to buy our BEER-INFUSED olives. We love their focus and wanted to put our most unique products on their shelves. Limited-edition BEER-INFUSED olives featuring Two Henrys "Roasted Jalapeno Blueberry Porter" available in both a mild & double spicy flavor. 12 oz jars for sale at Two Henrys Brewing Company in Plant City and Jug & Bottle in Tampa. Jars also for sale at Florida Festival of Fire & Flavor in Lakeland on June 11th and 12th, while they last. This is the 3rd year Cindy Snyders of K7CN and her family have gathered toys to donate to Johns Hopkins All Children's Hospital. This is where her grandson's life was saved when he was born, and she gives back each year. Bring a new toy or check donation and get a free drink, appetizers, bowling, photo booth, raffle items and more. Bring your family and meet this amazing family. 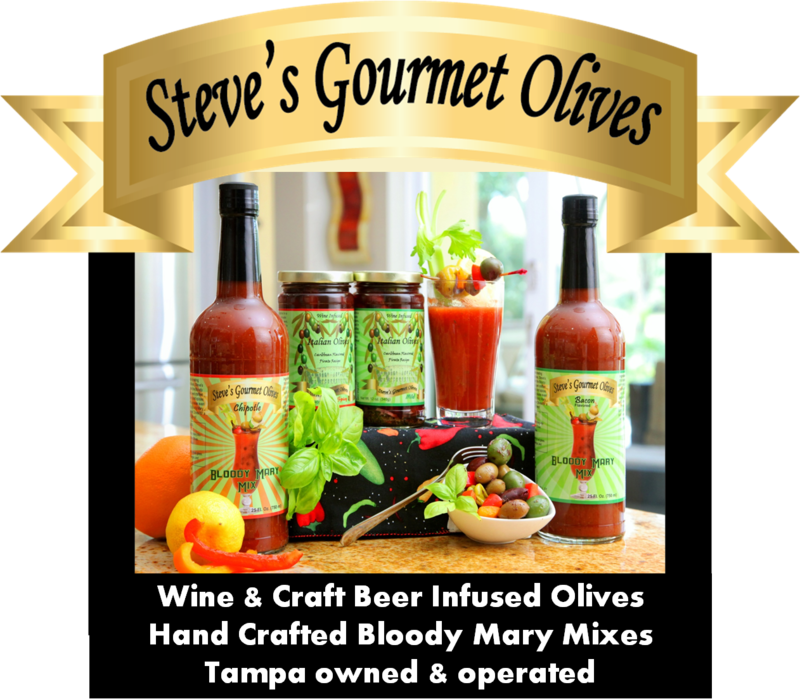 Thank you, Cindy, for featuring Steve's Gourmet Olives Bloody Mary as one of the free drinks. The 2016 Florida Festival of Flavor & Fire is a celebration of all things spicy. Hosted by the same coordinators as the Louisiana & Houston Hot Sauce Festivals, it features cooking demos, hot sauce competition and 75+ vendors of flamings foods from around the globe. Ahoy Mateys!! Sunday June 12th at 1:20 pm, Pirates UNITE at the festival. There will be a cooking demonstration featuring Pirate Jonnys and Captain Olive cooking up some Caribbean-inspired culinary creations worthy of your best mates. Come out and support many of your favorite Tampa Bay area businesses, including Jessi's Flaming Fruit Sauce, Red Hot Tiki, Intensity Academy Gourmet Sauces, Voodoo Chef, Pirate Jonnys and Steve's Gourmet Olives. We will be sharing a corner booth with Jessi's Flaming Fruit Sauce and will have samples of special collaborative recipes with her awesome sauces. We will have our limited edition BEER-INFUSED olives for sale here. There is a mild & double spicy version available for the true flame-thrower. Our product line is for sale at the following retail locations in greater Tampa Bay area, not all retailers carry all products. Thurs Jun 9th - OPERATION TOY HUNT, 5 - 8 pm, Duckys in Tampa, Bring a new toy and get a free drink, appetizers, bowling, photo booth, raffle items & more. Hosted by K7CN and Founders Professional. Benefits Johns Hopkins All Children's Hospital.